This guide explains how to connect Ozeki Phone System XE to Skype Connect for making calls to PSTN and GSM networks through your PBX. By adding Skype Connect to the Ozeki Phone System XE, your company can save on communication costs. With your skype telephone number, it is also possible to receive phone calls on your office VoIP phones from any traditional phone. 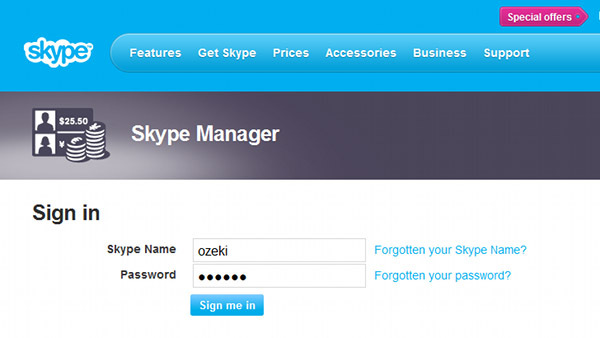 In order to connect Ozeki Phone System XE and Skype Connect together, first download and install Ozeki Phone System XE, then create a Skype account if you don't have one. If you have done these basic settings, please follow this configuration guide. Figure 1 demonstrates the simple operation of Ozeki Phone System XE with Skype Connect. After you have configured the connection, the VoIP phones of the office are ready to make calls from your Ozeki Phone System XE via Skype Connect to any cellphone or landline phone. 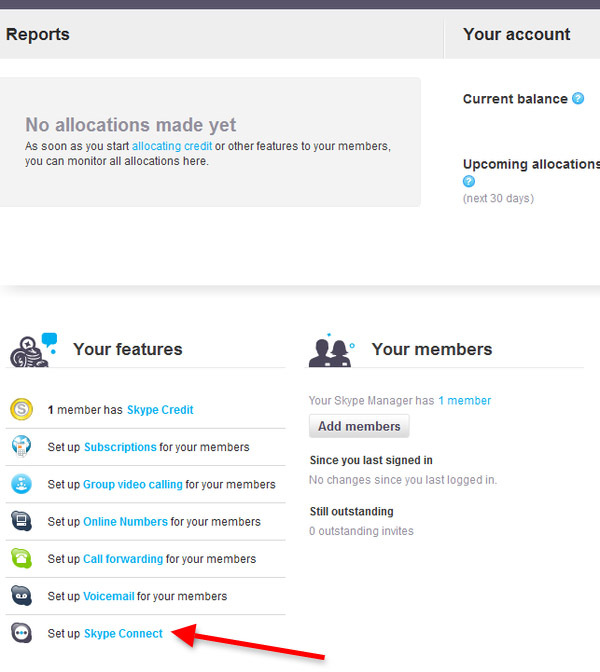 Please note that in order to make calls via Skype Connect you need to have some money on your Skype account. 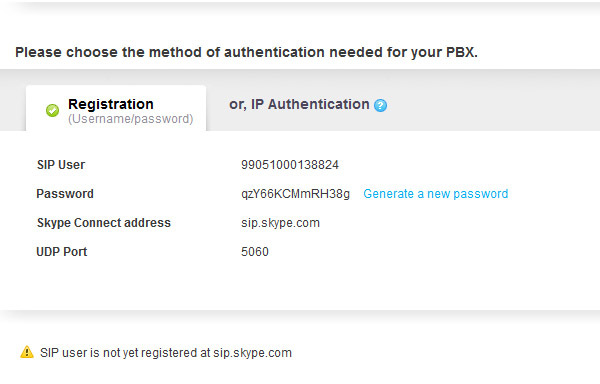 To start the configuration, login to your Skype account with your username and password (Figure 2). After you have logged into your Skype account, find and select Set up Skype Connect option in the Your features section of the web page (Figure 3). If you do not have a profile, you need to create a new one. For this purpose, click on the Create a new profile button (Figure 4). Then choose a profile name for the new profile. In this example, we are using Ozeki Skype profile. If you have provided a name, click on Next button. (Figure 5). The next step is to choose the authentication method related to Ozeki Phone System XE. Select Registration tab here, and enter your username in the SIP User textbox and your password in the Password textbox (Figure 6). 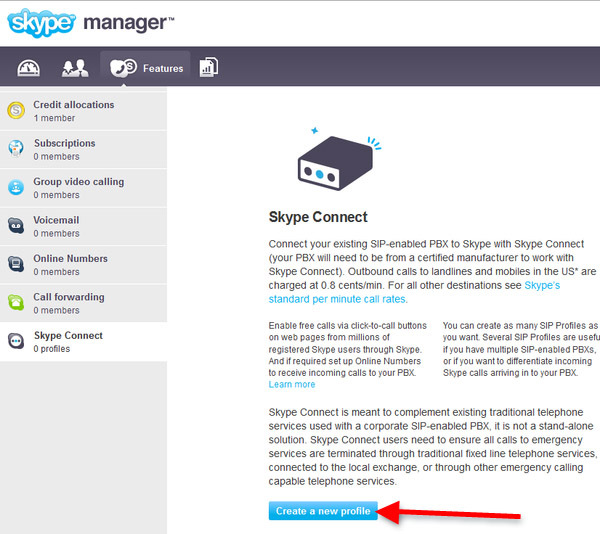 If you are done with these simple configuration steps, you can set the neccessary fields and can connect your Ozeki Phone System XE to your Skype Connect account by following the How to connect to VoIP service providers guide.